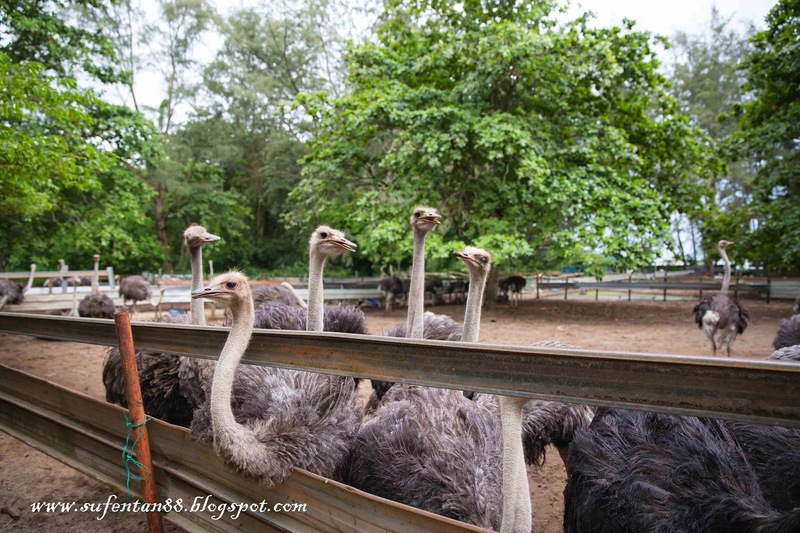 We visited Johor Ostrich farm last year end when we had a holiday in Desaru beach. 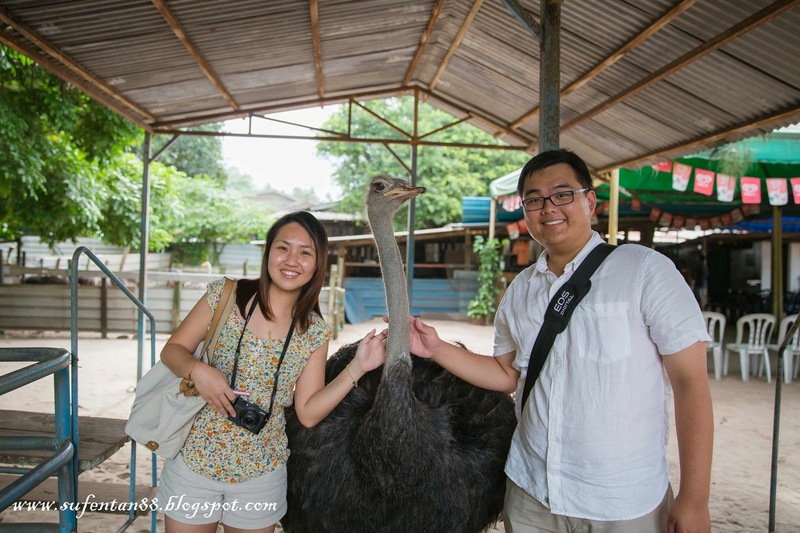 Since there wasn't many places to explore, we decided to take a drive to one of the attractions in Desaru -- the Ostrich farm. 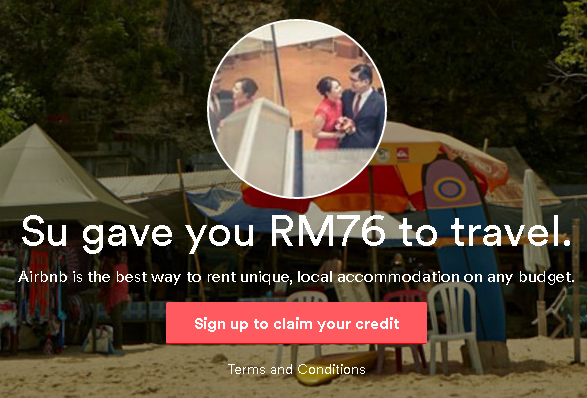 It took us around 25 minutes drive from Pulai Desaru. Here we are at the Ostrich farm. 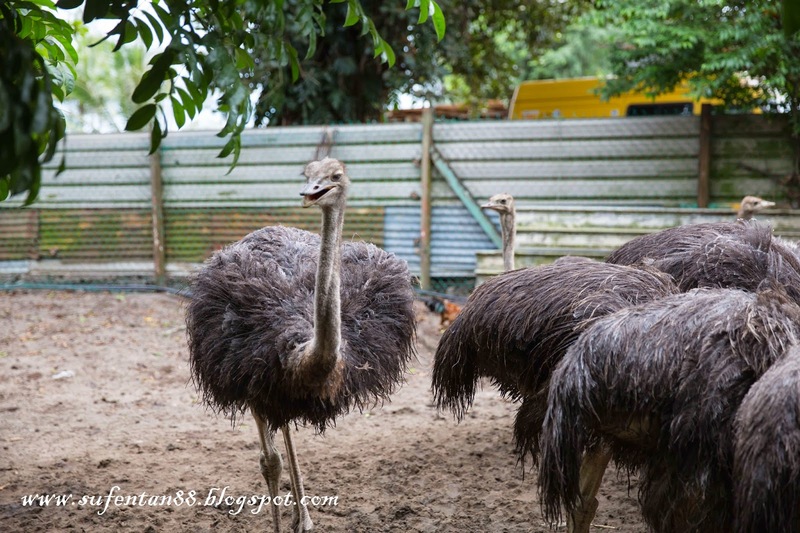 All the ostriches were kept behind the house, a big empty space. They even have a small stall beside the farm to serve food from ostrich meat and egg. Entrance fee for adult is RM 15 and RM 10 for children. You will need to pay at the counter before they lead you into the farm. The entrance to the farm is behind these houses. It is a family run business where we were warmly greeted by the family members during our trip. 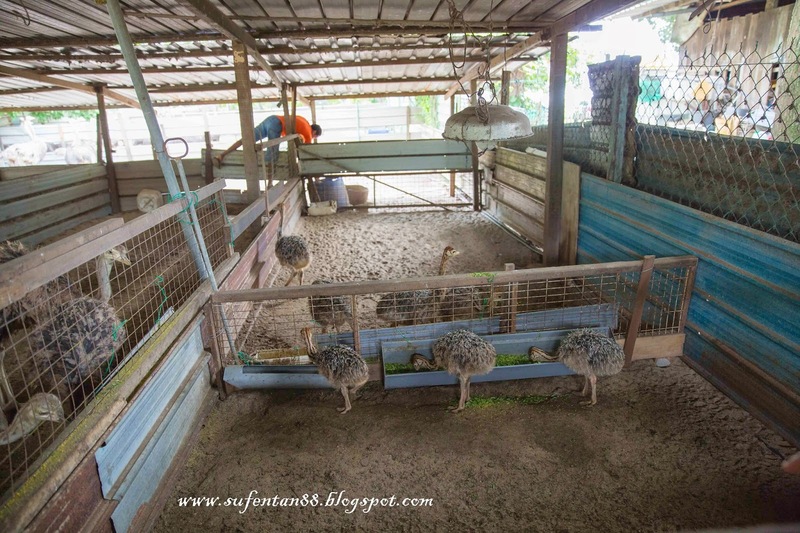 Once we are in the farm, there is a guide to bring us through the ostrich breeding and feeding process. Ostriches are separated into different areas based on their age. This is to ensure those bigger brothers & sisters don't bully the smaller ones. Genders of the ostriches can't be identified until their are mature, it is differentiated based on their feathers. Males will have beautiful black feathers while females will have greyish feathers. Ostrich's egg shells is so thick that each egg is able to withstand 100kg of weight. To break the egg, a driller is required to slowly open it. See how tough the egg can be! Lifespan of an Ostrich is around 30-40 years. 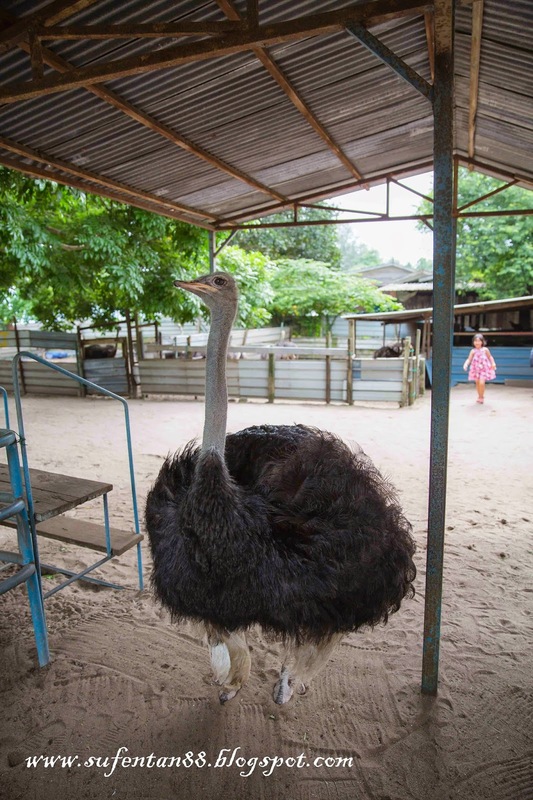 The oldest Ostrich in the farm is around 40 years old! Female ostriches will lose their feathers a little at a time once they lay their eggs but it will grow back after that. This is the most special and rare Ostrich in the whole farm, only 1 out of 300 can be found. This ostrich come in both sexes, it has the look of a male ostrich but female organs. It is tame and love to pose especially in front of the camera. Therefore it is the only one that is allowed to walk freely in the farm. See how it pose in front of the camera! The diva! After the tour, we were led to the souvenir shop. You can now bring home an ostrich egg shell lamp as a souvenir! They also sell bags, shoes, wallets and oil made from the Ostrich's skin and meat. Before we leave, we tried out the ostrich satay and omelette that was highly recommended by the guide. We were surprised that ostrich meat can be made into so many different food like ostrich bah kuh teh, burger, steak, meat ball, curry ribs and many more. This is what I call creative! It tastes similar to our normal chicken eggs except it is more smoother in terms of the texture. Just for your information, one ostrich egg can serve up to 4 plates of omelette. I would recommend to try the food before you visit the farm. Why? 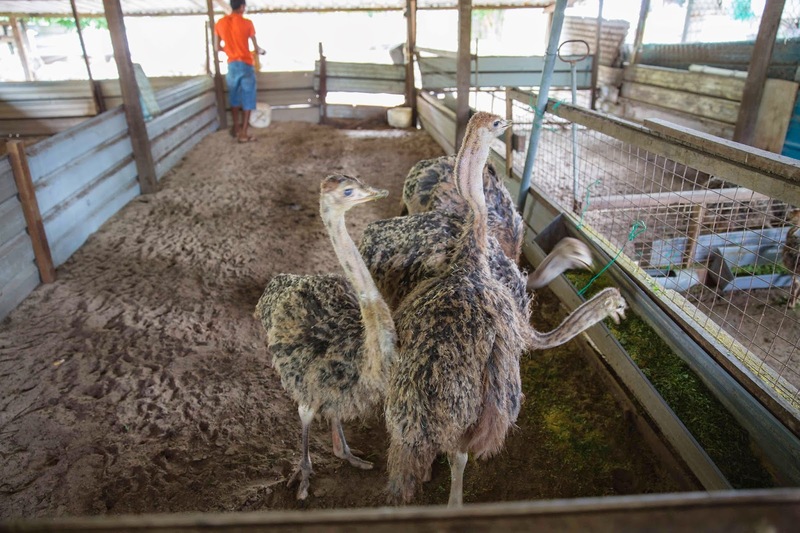 You will feel some discomfort when eating those meat after looking at those cute ostriches. I only managed to try out 1 stick just for testing purposes, felt so guilty! It tastes like beef except the meat is more springy and the smell of the meat is strong. I can't stand the smell at all. I guess that a different person might have a different view on the taste.